We could stay and wait it out, but the forecast doesn’t look any better for a few days. 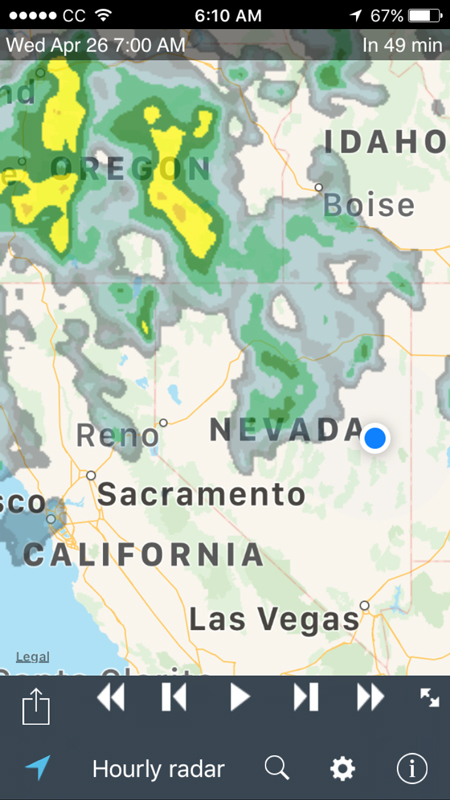 The last time I drove through this area I was towing a race car to Miller Motorsports Park in Utah, and I was caught is some serious hard rain… so much rain I abandoned the tow and waited it out in a hotel. However, this doesn’t have the look and feel of that sort of storm. After some thought, I decide to continue. Like yesterday, we have an early start, and plan on getting on the road and getting breakfast on the way. In this case in Eureka, NV about an hour away. The Hotel Nevada has a Keurig coffee maker in every room, so Testa Rossa can make herself a cup for the road. I’ve never developed a taste for coffee, and honestly never drink the stuff, but she is one of those “coffee people” who can’t get going in the morning without a cup. I find her very amusing, because she often will fall asleep holding a cup in her lap. Go figure. I go and load up the car, and check the oil. I do this every morning and despite its age, the engine doesn’t really consume much oil. It is about three-quarters of a liter down from when we left Houston. That’s roughly 1900 miles of driving, via the route we have taken. 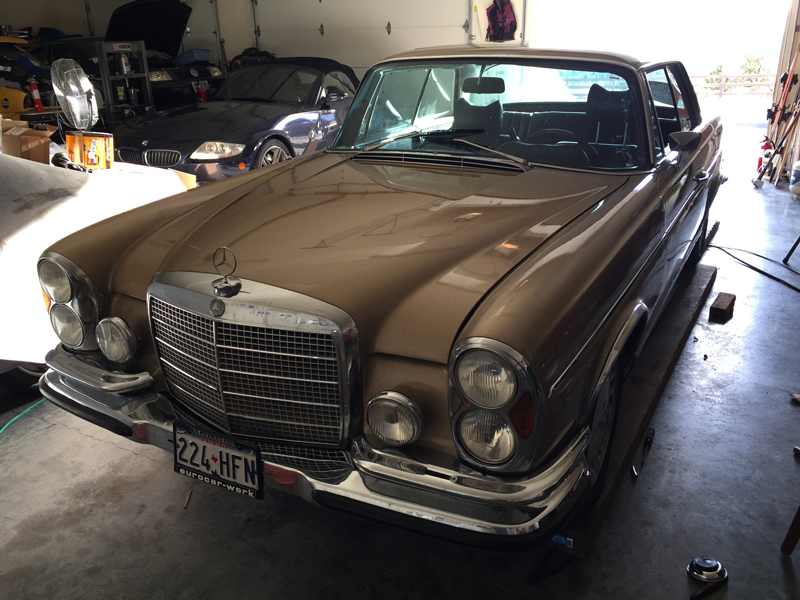 Not bad for a forty-five year old car. I top it up and get ready to roll. Testa Rossa has her coffee to go, and we hit the road. US 50 is our route today, at least as far as Eureka. Then Nevada 278 up to I-80. Testa Rossa snoozes away the miles, while I carefully eye her coffee cup to make sure she doesn’t let go of it in her slumber. It rains on and off, but never very hard. The sky is broken clouds, rather than ominously dark, so I’m cautiously optimistic. Arriving in Eureka, we looked up a good breakfast place and were pointed to The Pony Express Deli. As it was still very early it was uncrowded, just a few construction workers in there finishing their breakfasts. It was a delightful choice as the ladies there make everything from scratch. The home-made bread was amazing. I bought a jar of hot pepper jam to bring home as well. Very tasty! Leaving Eureka, we take Nevada Highway 278. 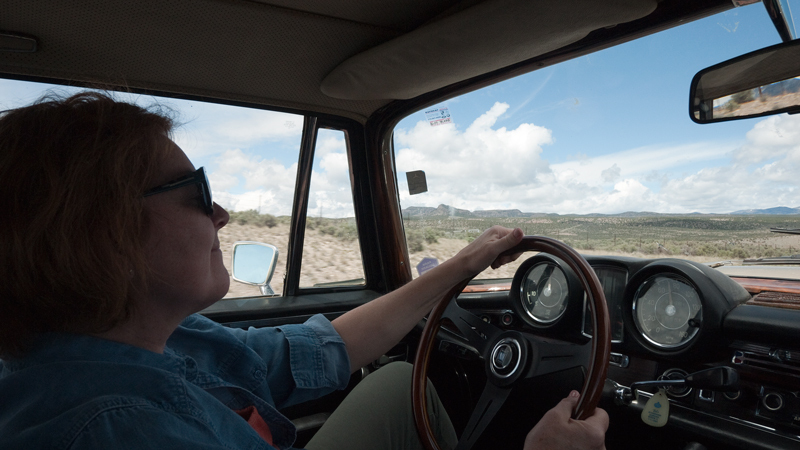 I’ve driven this road before on the La Carrera Nevada with my father in his Jaguar XK 120. That car is gone now. Come to think of it, I helped him sell that car on eBay, when that was the preferred marketplace for selling vintage cars online. Nowadays it is BaT, and that is precisely what I’m doing here; bringing this car home to help sell it online. 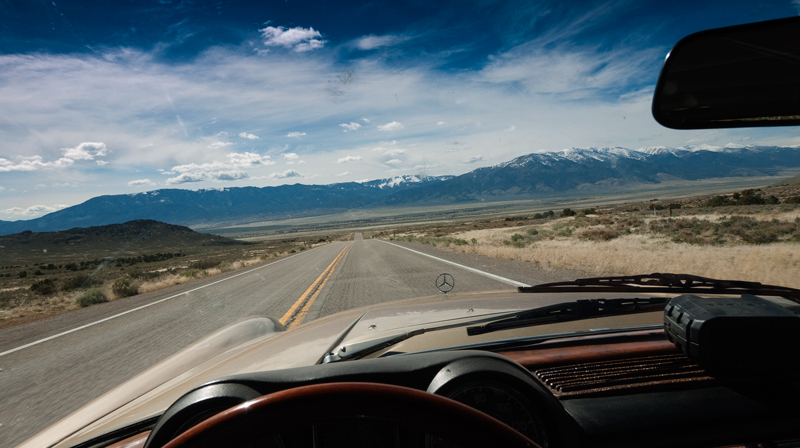 When he sold the 300sl he used a well-regarded restorer/dealer to handle the sale (I told him then, and still do, that he sold that car too early. They spiked in price shortly afterwards to nearly double. Oh well.) as that was an ideal venue for such a specialized and unusual collector car, but this one is far more pedestrian, and so onto Bring a Trailer it is going. Before that can happen though, we have to get it home. After some time on 287, I’m feeling a bit drowsy and ask Testa Rossa, now fully awake, if she’s up for some driving. She gladly accepts and carries on while I snooze. 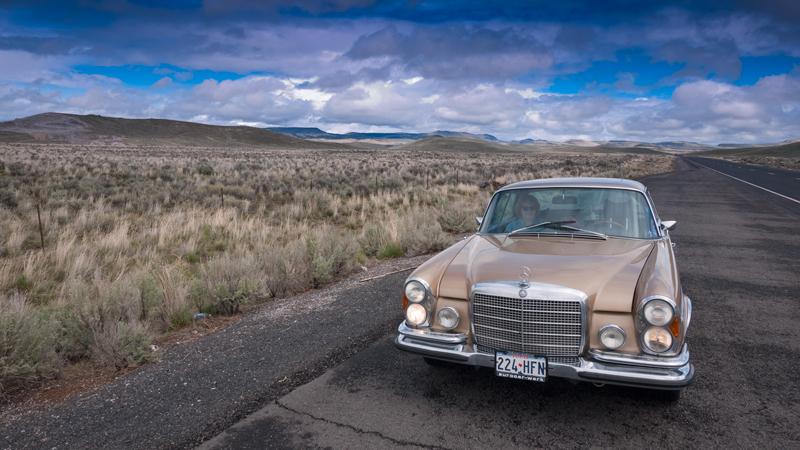 She pilots the Coupe onto the Interstate and west towards Winnemucca. I ask her to wake me when we arrive. She ends up waking me at one point before that to learn how to operate the windscreen wipers, but I fall right back into my slumber and manage to stay that way all the way to Winnemucca where we stop to get some gas. After the car is filled with gasoline I say that we should find some lunch to-go. It is still before noon, but after we start heading north, there won’t be another sizeable town for many hours of driving, and the chance of finding food is pretty near zero. In my head, I consider whether even our twenty gallons of gasoline will get us all the way home, and plan on a fuel stop in Burns. I have friends that have driven through Burns and not stopped to fill up who later regretted that as the long road towards Bend sucked their tanks dry… out there in the middle of nowhere is not the place you want to run out of fuel. 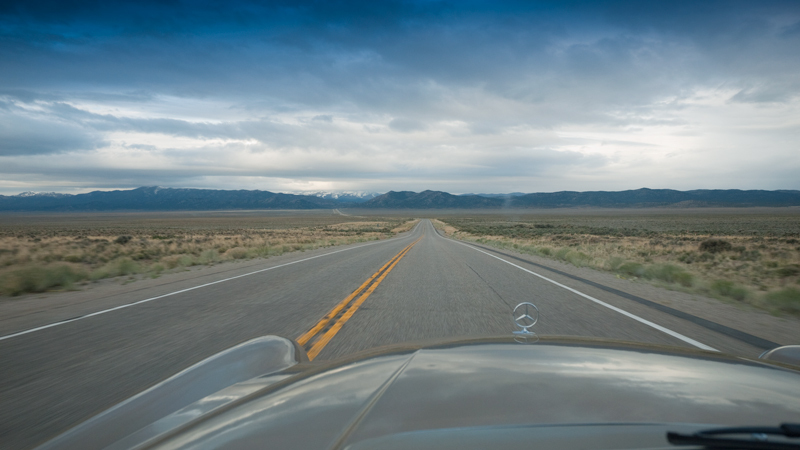 We stop at a sandwich shop and buy two for the road, then strike out north on US Highway 95. 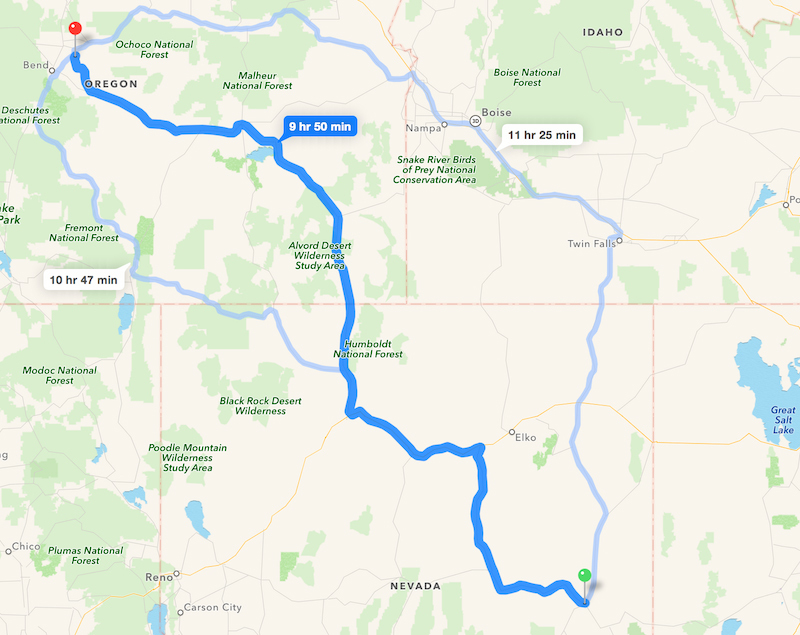 I thought about driving via Steens Mountain, which I did on my return trip from Utah towing the racecar, but I realize that is even more remote than 95, and at that time I had the benefit of multiple 5-gallon jugs of race gas in the bed of the truck to keep me moving along. Better to stick to the more well-traveled roads for this section. The rain comes and goes, and occasionally gets moderately heavy, but never enough to make driving difficult. We also get quite a few sun breaks along the way. In all, the weather is nowhere near as bad as I’d thought it would be. A while later just before we cross into Oregon a small store appears beside the road. I head in to take a restroom break and buy some cold drinks to eat with my sandwich. The place looks deserted, and the selection is pretty slim. I buy a couple of diet Pepsis, not because I like them, but because they are the only thing available. Back in the car I eat half my sandwich and then continue on. The landscape of southeastern Oregon is not that much different than the rest of the Great Basin topology, except that it likely receives a bit more precipitation, and that mostly in the form of snow. The sagebrush is more dense, certainly. The mountain ranges are here, but unlike further south very few, or no roads go through them. Certainly no paved highways. There are vast cattle ranches here, but no sign of them is seen, other than some occasional stock and maybe one gate in one hundred miles. I tell Testa Rossa that when I drove this road once before in my M Roadster, I would just floor it and go as fast as I could until I spotted another vehicle. No matter if it was traveling in my direction or opposite, I would slow the car down at the edge of visual range to something moderately close to the speed limit, which was then 55 MPH, but is now 70 MPH. Once past the other vehicle I would ramp it back up to as fast as I’d dare. 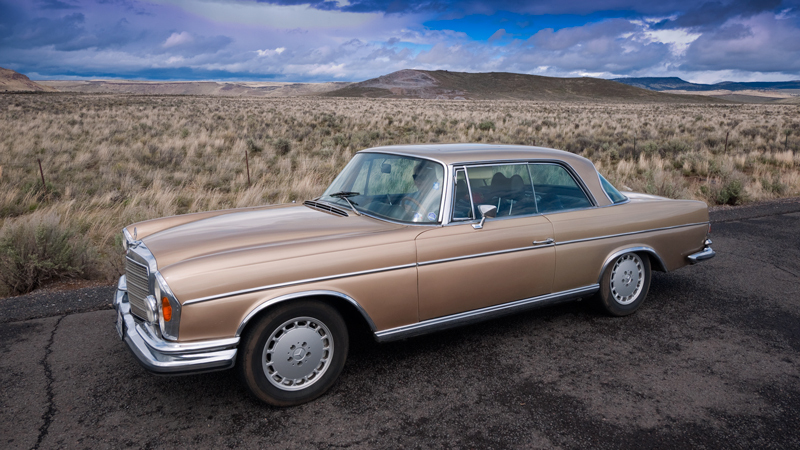 It makes the long drive through the Oregon Outback go much more swiftly. Today however, we’re poking along at the limit, and sometimes even below it, as the weather and a forty-five year old car dictate. At Burns Junction, which isn’t really a town so much as a weigh station, and an airstrip, we branch left onto Oregon Highway 78 towards Burns. This road is even more remote, and has far less traffic than US 95. 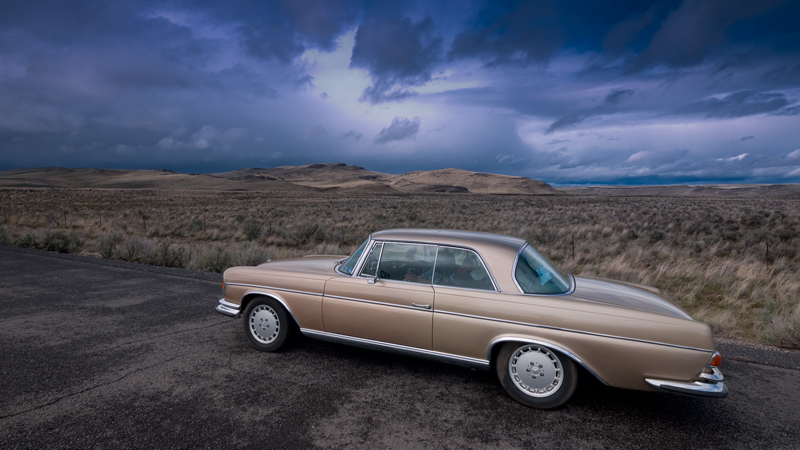 At a wide spot, in a break between light weather squalls, I stop, finish my sandwich and snap a few shots of the car out in this landscape. This is America’s outback. The middle of nowhere, and I live just west of it. It is another four hours of driving from here to home, and to be honest there isn’t much more to tell about it. 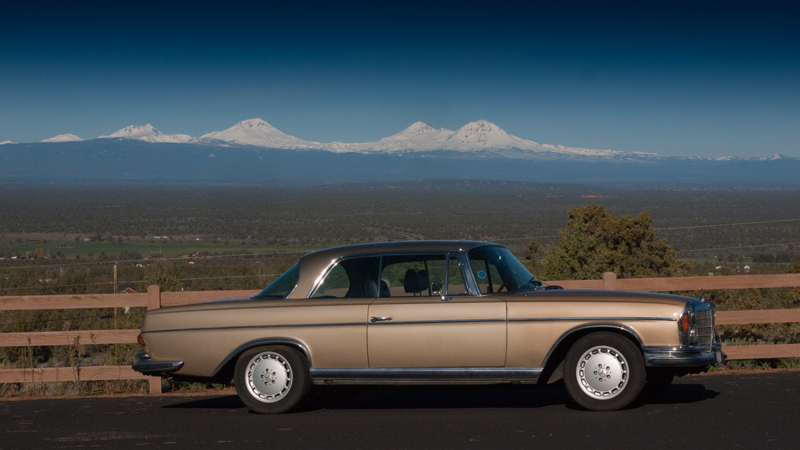 We fill up the car in Burns, and soldier on to Powell Butte over several hours. Finally home, I pull the car into the shop and wonder at how well it has driven. How comfortable it has been. 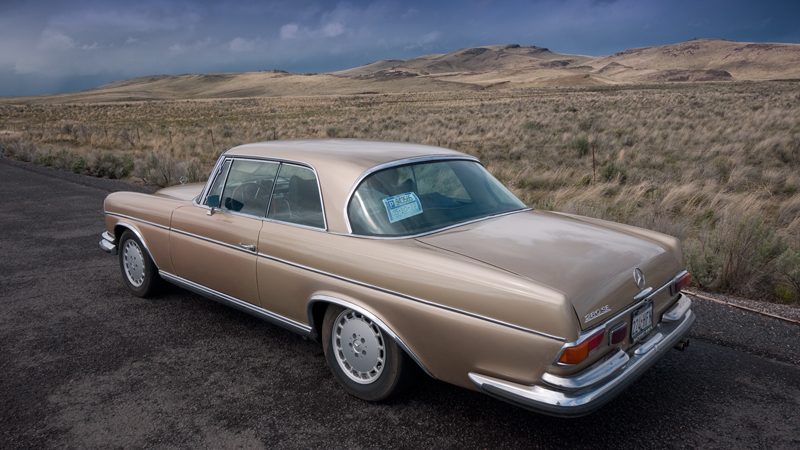 And most of all, how my parents came to love this car and hold onto it longer than any other. At home, in the shop. It is good to be home, and Testa Rossa (with far more energy than I) heads off to the store to buy a few things to make dinner, breakfast, etc. It is great to be home, with all the contentment that it brings; sleeping in my own bed, cooking in my own kitchen, and admiring the view I love so much. It will be listed online for sale soon and I’ll let you all know when that happens. Stay tuned! Reading these reminds a bit of William Least Heat Moon and even, a tiny bit, of Robert Pirsig. Though with this weblog I get pictures too. Next Next post: The Coupe is now on BaT.